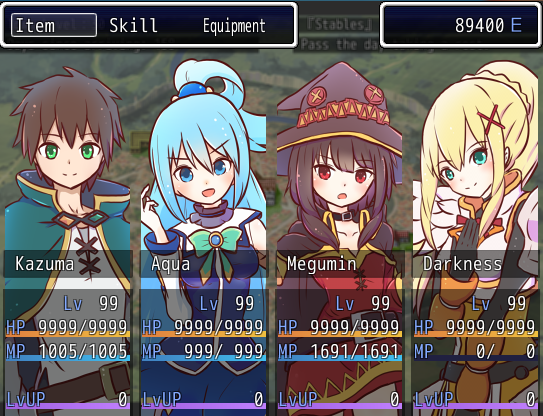 Announcement: KonoSuba – In the life! Translation Project Completed! & Short Story: Aqua-sensei! I’m pleased to announce that the KonoSuba! in the life! translation has been completed! Finally please click continue reading for a celebratory short story! As Aqua and I were taking a walk through town, a well-dressed gentleman approached us. The man that called Aqua ‘sensei’ seemed to be the butler of some famous household. Unable to read the situation, I turned to ask Aqua. “Anyway, I’m not an artist so I won’t take any money. I need to go right now to mess with a certain store that doesn’t have any customers, so I’ll have to turn you down. As I grabbed ahold of Aqua and concocted a plan to make her beg for mercy, someone suddenly showed up to intervene. ––In response to Aqua’s disciple who suddenly appeared and attacked me, I used ‘Drain Touch’ to render him immobile. Breathing heavily, I looked down at the man who couldn’t move after his magic power was drained. A girl who was running by us suddenly turned around. She slipped from her momentum and ended up grazing her arms and knees. Just like that, the girl began to sob like a certain crybaby I know. Although she didn’t seem like she would stop crying anytime soon, she stopped immediately when she saw Aqua’s art. …Since Aqua was doing an archpriest-like thing for once, I’ll do my best to back her up. I hurriedly turned to look, but there was already a huge crowd of onlookers. I think you really need to get a class-change. looks like the reddit people qorking with yuns has it done. He probably just have finals. I hope yuNS just take a break and not finish the business. I hope nothing bad happened to him. So I guess he’s probably still ok AND he’s still planning to translate the rest of the series. So all we can do is be patient or start learning Japanese. I’m doing both just in case. –at Cecily, hiding behind the sofa with her head poking out. Cecily supposedly loves little girls, but she’s been cautious towards Chris. But she still stared suspisciously at Chris. Chris looked depressed, probably from her history of gender misidentification. After all, she has short hair and dresses messily. Hearing the word “Eris cult”, Cecily sprang up from behind the sofa. Cecily wouldn’t lt Chris go, she probably has some sort of allergy for Eris worshippers. So that’s how it is. Tending to royal matters. I was going to give a “crime” briefing once enough members arrive, but now it’s impossible. I shook Yunyun’s shoulder to shut her up. I forcefully pounded the letter on the table. After finishing dinner at home, I asked Kazuma about something. Even though we are striking a noble’s home, the members of the theiving group are still too absurd. One of the many mysteries of Kazuma. He claims to have farmed monsters and killed bosses day and night with numerous friends, earning quite some fame. “Aye, I counted as a moderator of the guild. I was responsible for helping new members and scheduling boss battles. Maybe I learned managing skills for you bunch from those experiences. Kazuma was full of confidence. I couldn’t say he’s lying no matter how many times I hear it. To say, I really don’t understand those people well. Hearing Kazuma’s arrogant speech, the captivated Darkness–who had been stroking Chomusuke–reacted. Say, becoming a moderator for a guild at this age is substantial; maybe he really is extraordinary. They instantly started to focus-aggro at Kazuma, basically like goblins. Chris is really quite short-sighted, very befitting of the “underling” title. Chris peered at me with fearful and shocked eyes. Yunyun, who had been skillfully building a card pyramid, coldly interjected. Without realizing, Yunyun’s singleplayer gaming skills have soared. Just what is she trying to achieve? What is this underling implying? Thanks for this translations, there’s not a chance these get sold in my country. Already confirm no season 3 dude, holy moly, im so sad right know. Thanks for the translations man. Nice short story 🙂 What about LN 11 though, if I am correct it has been released, so will translation begin soon? He said that he would not translate it until he finish to translate the third spinoff. one can only hope, I’m thankful for the TLs nonetheless. http://i.imgur.com/gVctjhc.png this is why im not allowed to play these kind of games. What game is that? and RPG maker game? Aqua could have gotten rich by now if not for her generous splurging of money for parties, not taking money for her arts and performances and her pride that would rather make her cement bricks and sell bananas even if she needs the money badly to live. As usual, Aqua is a hillariously genius artist. Thanks Yuns! Thanks for the translation! Just asking, but can you please update the Gifting main page to include these side/short stories? I almost missed them. Aqua, Goddess of Art! Ha, ha, ha. 😊 Thanks for the short story.